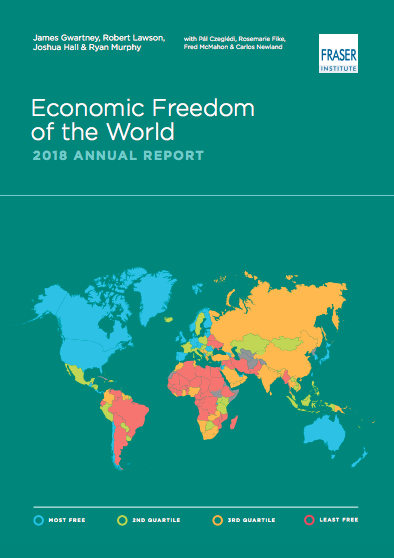 The Economic Freedom of the World seeks to measure the consistency of the institutions and policies of various countries with voluntary exchange and the other dimensions of economic freedom. The United States returned to the top 10 in 2016 after an absence of several years, with an overall rating of 8.03. During the 2009-2016 term of President Obama, the U.S. score initially continued to decline as it had under President Bush. From 2013 to 2016, however, the U.S. increased its rating from 7.74 to its current standing. This is still well below the high-water mark of 8.62 in 2000 at the end of the Clinton presidency. Hong Kong and Singapore occupy the top two positions. The next highest scoring nations are New Zealand, Switzerland, Ireland, United States, Georgia, Mauritius, United Kingdom, Australia and Canada, the last two tied for 10th place. Venezuela is again ranked as the lowest in economic freedom out of the countries of this year’s report. Republic, Republic of Congo, Syria, Algeria, Argentina, Libya, and lastly Venezuela. The total number of jurisdictions in the index is 162. (PPP con-stant 2011 US$) . income in the least free nations. Thanks for alerting your readers to this. The Fraser Institute does some good work. Who could believe it, coming from Canada after all. It's a bit of grown-up sanity in a country that's been nutty for some time. The FI was smart enough to recognize Walter Block's genius, as he worked for them years ago. The full report is available for free download at the Fraser Institute's website.